There’s never a dull moment in the heart of the South, and the ladies of The Real Housewives of Atlanta are back to take it to the next level in Season 6. NeNe relishes being Gregg’s new wife again and settles back into Atlanta after a year of living the glamorous life in Hollywood. 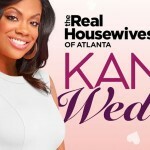 Recently engaged Kandi attempts to get closer to the altar with fiancé Todd, but faces unexpected road blocks along the way. She also adds to her growing entertainment empire by producing her first ever musical production, a project which brings all of the ladies together in very surprising ways. Soon-to-be-divorced housewife Porsha faces major setbacks in her life, yet continues to fight valiantly to get back on top. Meanwhile, Kenya battles her landlord over an impending eviction and delves into her family’s history, hoping to unlock the secrets from her childhood. Always on the go, Cynthia faces challenges of raising a teen daughter and is surprised by others that are not supportive of her choices. Phaedra resists slowing down with baby number two, studies nonstop to get her mortician’s license, and supervises Apollo as he tackles remodeling their new home. The stress on their marriage shows when Apollo’s opinion isn’t always aligned with his whirlwind wife. The series delves into the lives of six sassy women from Atlanta’s social elite. Juggling families, careers and jam-packed social calendars, the Real Housewives live their triumphs and frustrations out loud. Atlanta continues to be a character in itself as one of the hottest entertainment hubs in America. These driven and ambitious women prove that they’re not just “housewives,” but entrepreneurs, doting mothers and feisty southern women.